The press release for the upcoming Parrot AR.Drone 2.0, an update to the iPhone controlled quadricopter, has apparently been leaked online a bit early. The AR.Drone 2.0 is set to be unveiled at CES and will feature a 720p camera, video recording, flight data sharing, new piloting mode, increased stability and brand-new look. While in flight, the Parrot AR.Drone 2.0's front camera transmits real-time what the quadricopter sees onto the pilot's device screen. For the first time the AR.Drone 2.0 camera, with a 1280x720 resolution, shows a view from the sky in high definition with smooth and unbelievable images. The pilot enjoys an experience like never before, as if he was on board. For gaming purposes, this camera also can recognize specific shapes and colors to show augmented-reality elements on the smartphone's screen. Thanks to the new AR.FreeFlight 2.0 piloting application, players can record their own HD videos and watch them or share them with the AR.Drone community. Additionally, with the "travelling" feature, the pilot can film HD video sequences like a professional! Simply select the direction of travel (forward, back, sideways) and the duration, and the AR.Drone 2.0 does the rest. In addition to flying the AR.Drone, new application AR.FreeFlight 2.0 – available to download for free from the AppStoreSM and AndroidTM Market – offers players a new interface and several options. ● FreeFlight: Access to the piloting application. ● The pilot can record flights, take HD videos or photos and save them in the piloting device. All the flight data (altitude, speed, duration and place) can be saved, checked by the pilot and shared with the community. ● Guest Space: Access an overview of the AR.Drone 2.0, the best flight videos and practical information. ● Drone Update: Access the AR.Drone 2.0's free software updates. ● AR.Drone Academy: Get geolocation data of the best flight zones, watch other pilots' videos and access their shared flight data. ● AR.Games: Access applications/games available for the AR.Drone. ● Photos/Videos: Directly access your own videos and photos. Watch or upload to YouTube for the community to enjoy. After the AR.FreeFlight 2.0 pilot application has been loaded onto an iOS or AndroidTM smartphone or tablet, the Parrot AR.Drone 2.0 connects to the device via Wi-Fi. After connection, all the on-board instruments appear on screen with a cockpit view. Press the take off button briefly and the four brushless motors turn on. The AR.Drone 2.0 takes off. ● Press and hold the left button and the AR.Drone 2.0 follows the movement of the pilot's device: it moves forward, backwards or sideways when you tilt the tablet forward, towards you or to the left or right. ● Slide your finger over the right button, and the quadricopter rises, descends or rotates right or left. Thanks to Parrot's patented new 'Absolute Control' mode, the player accesses an even more intuitive piloting system. With a 3D magnetometer, the AR.Drone 2.0 knows its precise orientation with respect to the smartphone, which becomes the reference point. The pilot no longer needs to care about the orientation of the AR.Drone 2.0's front camera, which will accurately track the smartphone's motion and tilt. Experienced players will select 'Relative Flight' mode, the conventional flight mode. This disables Parrot AR.Drone 2.0's magnetometer. The pilot manages the quadricopter's orientation with no assistance. The heart of the AR.Drone 2.0 contains MEMS (microelectromechanical systems). ● 2 ultrasound sensors, which analyze flight altitude up to 6 meters. New! A pressure sensor completes the device and provides great vertical stability. ● 4 blades, specially designed for the AR.Drone 2.0, make it possible to carry out smooth flights. ● A second camera, placed beneath the quadricopter and connected to the central inertial unit, measures the craft's speed using an image comparison system. 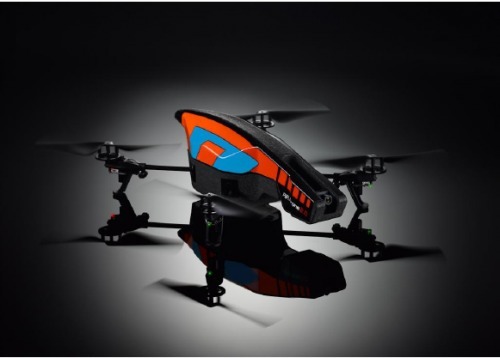 The Parrot AR.Drone 2.0 has 2 hulls with specially designed contours. Made of PA66 (a material used in designing car bumpers), they are light, highly resistant and protect the quadricopter. For outdoor flight, the contoured hull, available in three colors (orange/yellow; orange/green; orange/blue), reduces wind resistance and preserves the AR.Drone 2.0's handling and stability. When indoor, a second hull protects the blades from any impact. The black-and-white cockpit, underlined with a red stripe, reinforces the quadricopter's mysterious, thrilling appearance. Finally, light-emitting diodes (green in front, red in rear), positioned on the landing gear, help the pilot track the orientation of the AR.Drone 2.0 for easier flying. In order to expand the use of the Parrot AR.Drone 2.0 and its compatibility with other operating systems and to develop new flying games and applications, Parrot is providing developers and members of the Apple and AndroidTM communities with a software development kit. By logging in at https://projects.ardrone.org and accepting the terms of the license, developers can access the source code used to fly the AR.Drone 2.0. A wiki and a tutorial also are available. A forum is available to discuss new developments and share feedback with Parrot engineers. The Parrot AR.Drone 2.0 runs on a rechargeable lithium-ion battery and will be available for purchase at selected retailers in Q2-2012 in the United States for $299 MSRP.